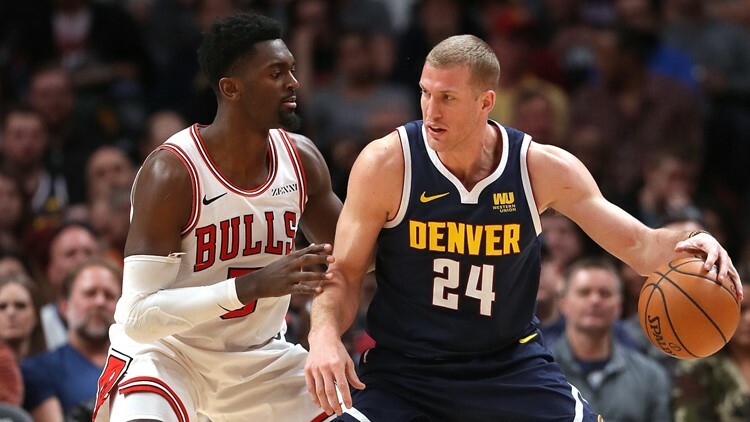 Mason Plumlee #24 of the Denver Nuggets drives against Bobby Portis #5 of the Chicago Bulls at the Pepsi Center on January 17, 2019 in Denver, Colorado. Denver bounces back with huge home win over Chicago on Thursday night. Jamal Murray scored 22 of his 25 points in the third quarter, Nikola Jokic finished two rebounds shy of another triple-double and the Denver Nuggets cruised past Chicago 135-105 on Thursday night for their 12th straight home win over the Bulls. Chicago hasn't knocked off the Nuggets at the Pepsi Center since Feb. 8, 2006. The Bulls also remain winless in 2019, with their losing streak stretching to nine in a row. Jokic did a little bit of everything, including a move where he went around the waist with the ball to avoid a defender and drew a foul while making the shot. That kicked up chants of "M-V-P!" The 7-footer from Serbia didn't have his best shooting night, though, missing several easy baskets in finishing 6 of 18 from the field. Bulls: Rookie F Wendell Carter Jr. was ruled out with a sprained left thumb. He's day to day. ... G Zach LaVine was held to eight points, well below his average of 23.2. "I don't want to leave our fight in the gym and have nothing left in games," he said. "He took it on the chest that he's got to play better for us to be successful. I'm just proud of him," Boylen said. "What we're striving for is to play better basketball and to own the 'Bulls' across our chest."